Our goal is to achieve the most efficient and reliable transmission of power from input to output. Xtrac provides the ultimate engineering solutions by combining expertise in three key areas; Advanced Engineering, Design and Production Engineering. The commitment to the latest Information Technology and Computer Aided Engineering (CAE) advances the possibilities within the engineering group. This technology enables Design, Production Engineering, Advanced Engineering, Manufacturing, Inspection and the customer to utilise a single source of data, allowing true concurrent engineering to take place throughout the entire process. Vehicle manufacturers, race teams and championship organisers alike, rely on our immense knowledge and expertise that has been accumulated through our analytical engineering methodology in design and manufacture, backed up with real world data and experience. With over 65 engineers qualified to bachelor, masters and additional post graduate levels, Xtrac has a highly competent and professional engineering capability with considerable experience of transmission and driveline design. Armed with the latest generation of Siemens NX computer aided engineering (CAE) and manufacturing (CAM) software, our engineering team is able to undertake clean sheet designs and optimise them quickly and efficiently. This includes a solid modelling, finite element analysis and dynamic systems modelling capability. Project teams lead by Principal and Senior Engineers ensure that our innovative designs meet our customers’ exacting requirements through regular client liaison and project reviews. With a diverse customer base coming from motorsport and the automotive and engineering business sectors, our highly creative engineers are constantly challenged to think of unusual, novel and innovative solutions to satisfy the technical and packaging requirements for a complete transmission system. Our engineers are highly conversant with “Design for Assembly” techniques, with rigorous cost management and value engineering on all projects. Passionate and totally committed to their tasks, our engineers relish working under the tight timescales that our motorsport and automotive customers demand, while ensuring no compromises are taken on product quality. Xtrac’s advanced engineering group, encompassing Gear Technology, Research & Development, Production Engineering and Metallurgy, operates as a consultancy providing forward-thinking engineering solutions to keep us and our customers well ahead of the competition. Knowledge and a proven understanding of gear form design is continually challenged as our engineers, using a combination of powerful proprietary and in-house developed software tools, carry out in-depth analysis and validation of new designs and materials. 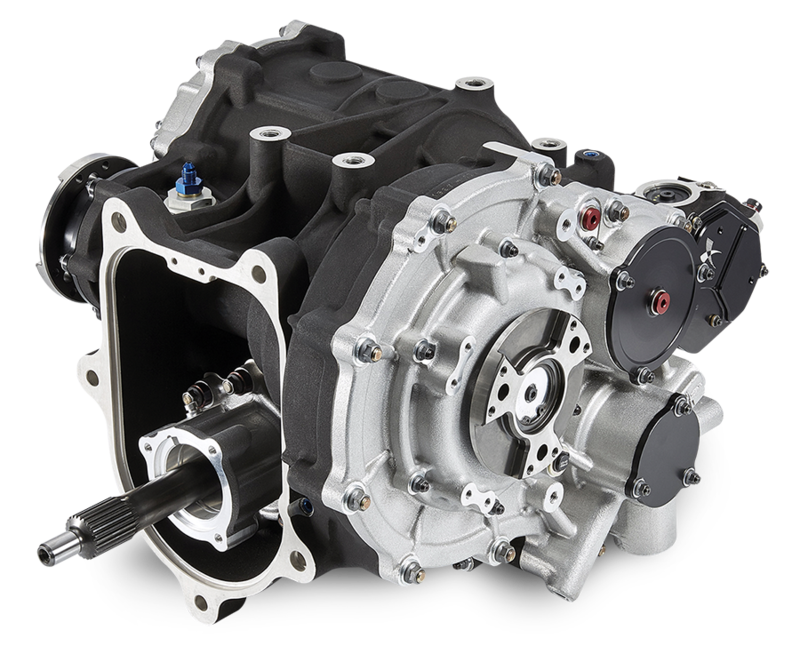 This ensures that when it comes to the most efficient transmission of power and torque, we are always at the cutting edge when optimising the strength, weight, and reliability of components. For high performance road vehicles it also means the optimum transmission acoustic performance. Our advanced engineering group covers an extensive breadth of analysis capability from the micro level of a gear tooth or spline to the macro level of a full transmission casing model with vehicle suspension inputs. The MTS tensile test machine control system has the latest FlexTest 40 hardware and Multipurpose Elite Testsuite software. This package gives enhanced flexibility in the definition of test profiles, rig control and automated reporting. Sophisticated control methods can be applied to any load test, with the option to apply closed-loop control to external variables from customer sensors as well as via in-built load and displacement parameters. We acquire data by extensively using HBM laboratory specification equipment, with portable modules for vehicle based acquisition similarly specified to laboratory standards. Significant value is added to our customer’s designs and to our own designs by applying the high level of manufacturing knowledge of our dedicated production engineering specialists. Their expertise and deep understanding of hi-tech manufacturing is applied in conjunction with our highly evolved method of issuing drawings specific to each and every stage of production, which we refer to as our “stage drawing methodology.” This sophisticated approach to production engineering also includes detailed quality plans. Integrated seamlessly within our project team office environment, our design and production engineers sit alongside one another to facilitate a strong, cohesive and multidisciplinary approach to each project under the close supervision of an experienced senior engineer. As well as designing and manufacturing virtually all the components required to produce a complete transmission, we also design and manufacture the specific tooling, gauging and work holding required for each particular project. To further reduce lead time and related costs, we also deploy an extensive library of specialist tooling and gauging. While dedicated production tooling is similarly implemented for longer running production batches. Virtual assembly planning ensures that all our transmissions are built using “Right First Time” principles. We assess and rate every spur and helical gear that we produce according to ISO6336:2006 which utilises Xtrac’s extensive materials library for fatigue bending and pitting resistance. We design bevel gears using the Klingelnberg KIMoS closed loop system, which is fully integrated into our manufacture and inspection operations. The same unique processes used throughout our advanced engineering group are also applied in the design, analysis and validation of bespoke bearings using proprietary software in conjunction with additional tools we have developed in house. High specification computers running ANSYS software provide the means for our engineers to carry out powerful finite element analysis (FEA). Moreover, we have developed and validated over many years very specific FEA protocols to ensure timely yet highly accurate data. The effect of various transmission parameters on whole vehicle performance is assessed using in-house developed vehicle simulation models. Working closely with our customer’s application engineers, our very experienced calibration and systems engineers support the initial specification, sourcing, test and development of the transmission control system. Support can take place in the laboratory environment and at vehicle proving grounds and the race track. We work closely with new and established customers and can supply complete turnkey transmission solutions, including sophisticated control systems and all the technical support required. This not only allows us and our customers to realise the full potential of each product, but also gives greater scope for innovation and success. Seeking to optimise every transmission component, the material we choose has become ever more critical to success. Xtrac continues to develop its unique and ground-breaking range of steels and operates strictly controlled metallurgical processes to ensure that material physical properties meet precise performance criteria. With full control over our design and manufacturing, including having our own vacuum and atmospheric heat treatment facility, our design and production engineers can extract the full potential from the material within our customer and in-house transmission designs. With our customers fully involved, the on-going testing of both new and existing materials, using our state-of-the-art Buehler and Zeiss equipped research laboratory, ensures an ultra-competitive edge in an ultra-competitive motorsport and automotive environment. Xtrac Inc. has a facility in Indianapolis located just a few minutes’ drive from the Indianapolis Motor Speedway. The 12,000 sq ft (1,100 square metres) facility is equipped to offer engineering and spares support for our ever expanding US market. This also includes gearbox assembly, rig testing and servicing as well as track support for IndyCar, IMSA, LMP3, PWC & Baja Off Road series and our various South American series’. Since the formation of Xtrac Inc. a number of support trailers have been used to offer extensive track side assistance to teams. IMSA appointed Xtrac Inc. as the exclusive service provider for the LMPC series being raced in ALMS (now WTSCC) from 2010 and are the exclusive worldwide supplier for LMP3 cars which raced in the new IMSA prototype challenge series in 2017, replacing LMPC from 2018. Xtrac Inc. is linked to the UK base with an engineering connection via the company’s Siemens NX CAE system, and a constant exchange of engineers ensures that the latest engineering and quality standards are maintained throughout the group. The same ERP system is utilised at Xtrac Inc. and Xtrac Ltd. in the UK and is also connected via a 24 hour direct link. Xtrac also has an engineering and support office in Mooresville, North Carolina. Our experienced R&D engineers can also be embedded into a customer organisation during the validation phase to ensure continuous support for the calibration, integration and development of new transmission and driveline products. This enables our customers to achieve a peerless level of development support with Xtrac engineers fully dedicated to racing teams to ensure optimum transmission performance and a live link to design engineers back at their global headquarters. Our automotive OEM customers enjoy a similarly fully integrated service from our development team who can assist with the creation of new standards of testing, gear shift calibration, sound engineering and NVH refinement, as well as other correlation activities throughout the project. Our factory based support includes transmission rebuild services, which can also be conducted at the track with dedicated technicians servicing one or more teams and if required on a race by race basis. We also offer support for a complete motorsport series where the entire grid can be serviced with our engineers, again on a race by race basis or throughout the entire season. Regular track and test attendance by our engineers and business managers ensures that all aspects of a project or product can be looked after on a regular basis with direct and instant feedback.